Simmering anger at Britain for interfering in American trade, impressing U.S. sailors into the Royal Navy and standing in the way of westward expansion led the United States to declare war in June 1812. With British forces distracted by the country’s ongoing war with France, the United States scored some encouraging early victories in the War of 1812. But after Napoleon’s defeat at the Battle of Waterloo in April 1814, the British turned their full attention to the war in North America. That August, British troops invaded Washington, D.C. and set fire to the White House, the Capitol and other government buildings. The Royal Navy then trained its sights on the key seaport of Baltimore, Maryland. On September 13, U.S. soldiers at Baltimore’s Fort McHenry withstood some 25 hours of British bombardment. Early the next morning, they hoisted a gigantic U.S. flag over the fort, marking a crucial victory and a turning point in what would be considered a second war of American independence. A Maryland-born attorney with a thriving practice in Washington, D.C., Francis Scott Key watched the bombardment of Fort McHenry from a ship anchored in Baltimore’s harbor. 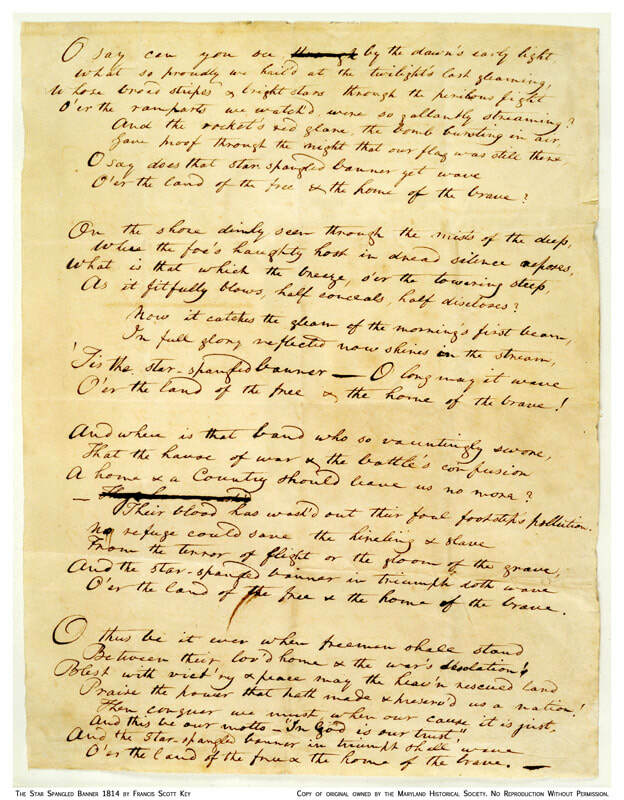 Francis Scott Key wrote “The Star Spangled Banner” and its initial verse on the back side of a letter while watching the large American flag waving over the fort that morning. Back in Baltimore, he continued working until he had completed four verses (only one of which is commonly known today). After a local printer issued the song, originally called “Defence of Fort M’Henry,” two Baltimore newspapers printed it, and it spread quickly to various cities along the East Coast. “The Star-Spangled Banner” made its sporting-event debut in September 1918, during that year’s first World Series game between the Chicago Cubs and Boston Red Sox. In addition to the ongoing toll of World War I, a cloud of violence hung over Chicago’s Comiskey Park, as a bomb had torn apart the Chicago Federal Building just the day before. During the seventh-inning stretch, the military band on hand struck up “The Star-Spangled Banner,” and in a moving spectacle, players and fans alike fell silent and saluted the flag. The practice soon spread across major league baseball, and into other sports, and eventually became a widely accepted pregame tradition. “Star-Spangled Banner” writer had complex history on race, The Baltimore Sun. “How the national anthem—and subverting it—became a national tradition,” The Washington Post. “How the National Anthem Has Unfurled,” The New York Times. “The Song Remains the Same,” ESPN the Magazine.